Janice over at The Vivienne Files has been posting awesome articles about wardrobe building for years. Her latest series, Starting from scratch, is pure genius, beautifully illustrated and with excellent explanations of what, why, and how. There’s also a very lively discussion related to her articles on the Stitcher’s Guild. I’ve been waiting every morning with bated breath to see what the next step brings. Last night, I decided to see how it would look in my own wardrobe and what I might need to sew this fall and winter. 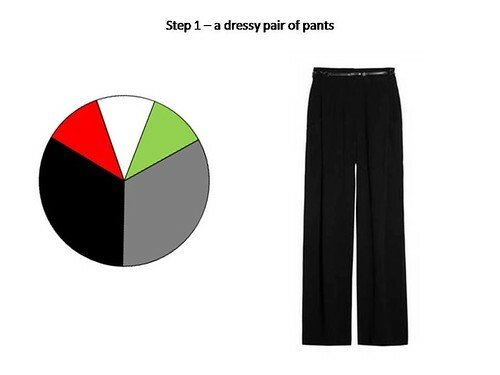 The first step is a pair of dressy pants. I already have one. It will need to be replaced soon but for now, it will do. Step 2 is a versatile, comfortable pair of shoes. For me this would be my Ecco Kiev. I love them. Step 3 adds a cardigan and a tee shirt. I have these already. 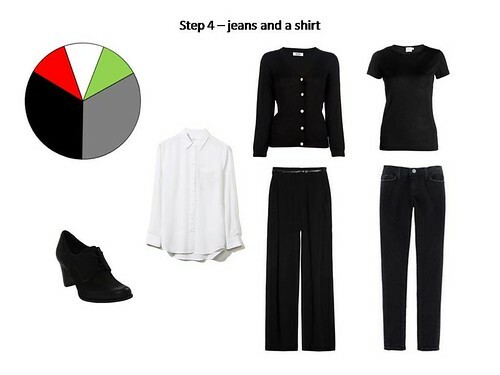 Step 4 adds jeans and a shirt. Jeans in the neutral color, which means I’d have to make them. So I’ll be on the lookout for some nice black denim. The shirt already lives in my closet. 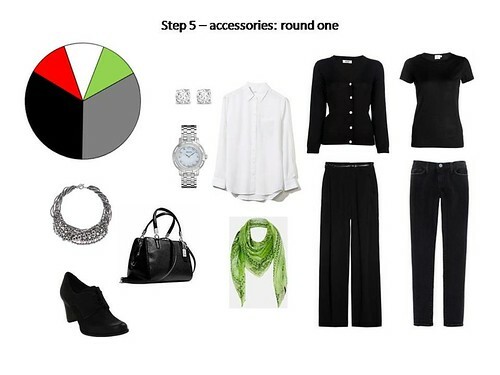 In step 5, we add accessories: handbag, earrings, watch, bracelet, necklace, scarf – whatever works. I’m not big on wearing bracelets so I didn’t put one here, opting for a necklace instead. Step 6 adds accent color tops (one each) and a scarf. I already have sweaters in these colors so I added them. Janice shows tops that can be worn under cardigans, which I might try in a future version of this. The scarf is also one I already have. 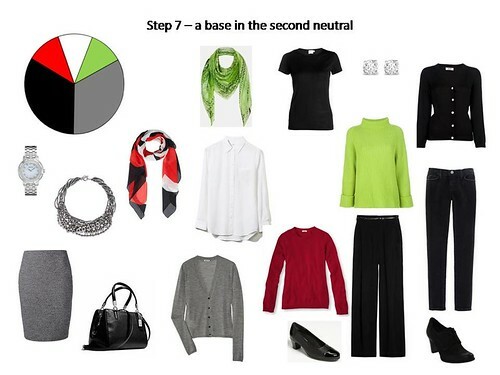 In step 7 we add a top and bottom in the second neutral, and a pair of shoes. Janice shows a pair of pants but I prefer skirts so that’s what I chose. I would need to make this. For the gray top, I have a cardigan that will work well. Janice shows the shoes in the second neutral color but all my shoes are black and that’s not likely to change anytime soon, so I added a pair of Munro pumps I already own. Now we take a brief pause to see what outfit options we have and whether this is the direction in which we want to go. I put these together and I like them, although I don’t really like sleeves on sleeves so the white shirt with a cardigan is not my favorite option. I’m not sure if I want to rethink the white shirt or just not worry about wearing a cardigan with it. And this is as far as I’ve gotten for now. Janice has plenty more steps and I’ll work through them in the next few days. I want to be ready with a good plan when the fall 6-PAC sew-along starts on the Stitcher’s Guild. Are you following along with Janice’s posts and looking at your wardrobe with new eyes? Please share in the comments. What a great wardrobe – and thank you SO MUCH for mentioning The Vivienne Files. I’m so happy that my work has been helpful to you! Thank you, Janice! I love your blog – you share so generously with your readers. In reading your posts I always learn something new, or a light bulb goes off, or your pictures spark an idea. And the way you systematize wardrobe building is nothing short of genius. Really. Love that you “shopped” your own closet. Sometimes, we crave the high from shopping and our closets become obscenely packed and we can’t even see the gems. You could continue to do this and put these items aside until you had a well curated wardrobe. I would then move everything else out to time out and see how this works for a period of time. At the end of that time I’d reassess the stored clothing and see if there are gems I missed, things to alter, fabrics to reuse, etc. This would be an easier way to pare down an overwhelming wardrobe that doesn’t require a marathon session. Thanks for all your insight. Funny, it didn’t even occur to me to not start with things in my closet. Your plan sounds like a good one for long-term wardrobe solution. 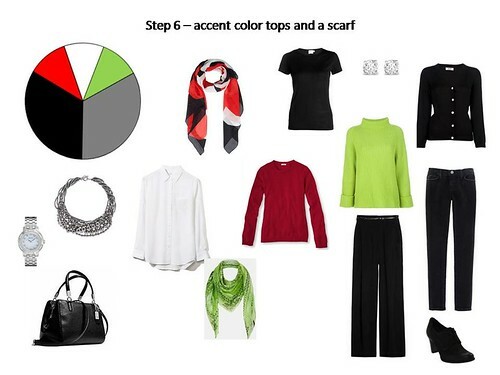 I love seeing Janice’s wardrobe idea done in your colors and style! I found it interesting to see what you include that you already have and what you will need to add. I’m looking forward to your future posts on this topic. Thank you Dawn! I’ve been working on the next installment – easier said than done. Thank you Karen! I hope you’ve enjoyed reading Janice’s posts. It would be pretty easy to adjust to suit Florida weather and style. I just put together an entire wardrobe from my closet in the black, grey, red, white and royal color scheme. I don’t have to buy a single item to make it work. This whole concept has changed the way I’m thinking about my wardrobe. I think I can also put together 2 more color schemes with very few purchases. That’s pretty awesome! It shows you have consistent style and color preferences. I have been following along with the series, too. I really like how you have adapted it to your preferred colors and shopped your closet. I have been thinking about how to implement this for myself, but I haven’t got there yet! Thank you! Good luck figuring it out and I hope you share on your blog when you do. You are already a master at building a wardrobe. You always plan your pieces so well. I like the bit of red that you added and the patterned scarf. Thank you Rhonda! There will be more red in the upcoming steps.